Bruises are extremely common. Most people at some point in their lives will experience the blue, black or purple coloured bruises which occur when the blood vessels within the skin are injured. During bruising the small blood vessels near the skin surface break and cause the red blood cells within the skin to leak. This is what causes that coloured appearance. As the body heals and the bruises begin to disappear they fade to either a yellow, green or brown colour and eventually they disappear altogether. Bruises can be caused by injury such as falling over or when you experience bumps and knocks. Many bruises are normal and inevitably happen every now and again however, if you experience frequent bruising it is best to see medical advice from your general practitioner/doctor as there could be an underlying cause for your excessive bruising. It’s also good to keep in mind that age, certain medical conditions and family history can also play a part when it comes to bruising of the skin. Over time bruising should disappear but if you wish to speed up the healing process you can apply a cold compress to the skin for around 10 minutes. This helps to stop the bleeding. After around 2 weeks all bruising should disappear, if the bruising remains, seek advice from your GP. If you have bruising that you want to cover up for a special occasion, Veil Cover Cream is a really effective Bruise Concealer. 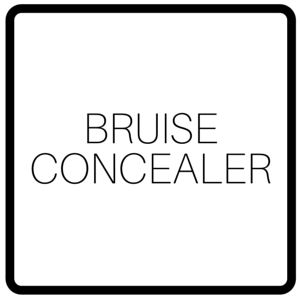 The high coverage pigmentation will help to conceal the discolouration in the skin making bruised areas blend effortlessly in with the rest of your skin making bruising undetectable. Unfortunately some bruises aren’t causes by the odd knock or accident. Some bruising is caused by deliberate domestic violence. If you or someone you know suffers from domestic violence please know there is help available. There are a number of excellent charities and organisations such as Refuge, Standing Together, National Centre For Domestic Violence and Victim Support who are all there to provide help and support.